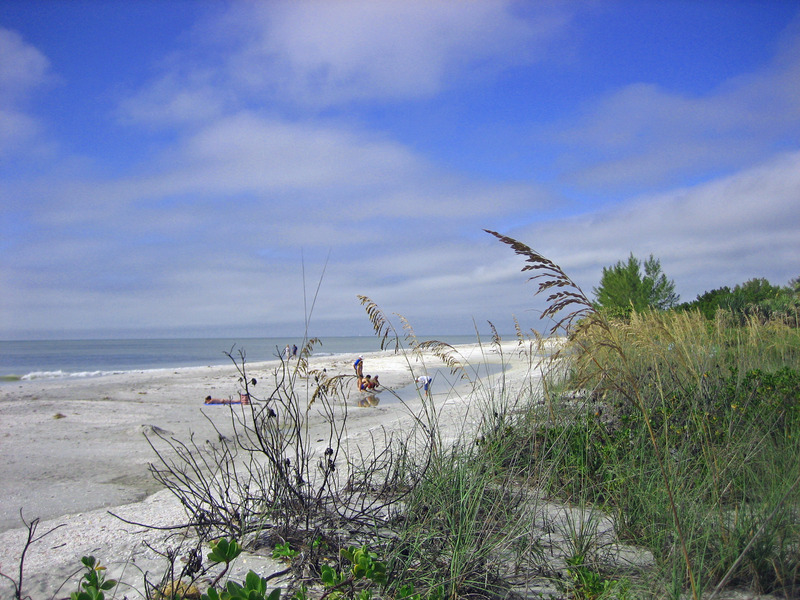 SanibelSusan reports this week that the team and I are very thankful to be living in Southwest Florida. 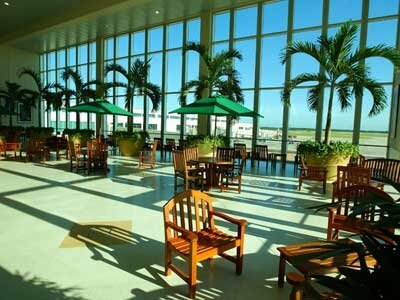 Folks flying in and out of RSW have had some delays, but those here this week just enjoying Sanibel and Captiva have had fabulous weather, particularly when compared to the rest of the nation. The residual effect of the northern storms brought a cool down here today. 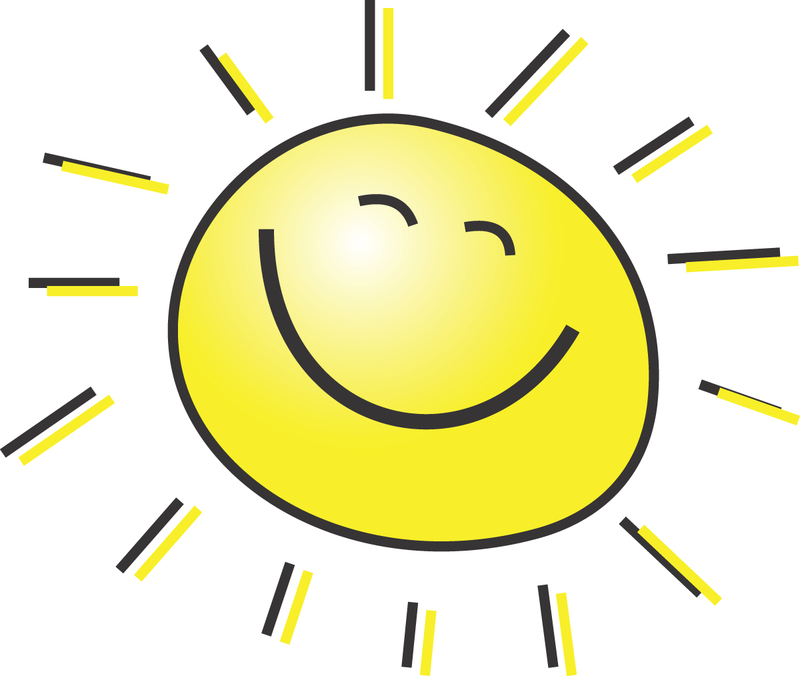 From temperatures in the high 70’s/low 80’s most of the week, today it is not expected to reach the 70’s – a nice change and a chance to wear long sleeves. Warm weather returns tomorrow, with the next chill not expected until Mon night into Tues. It will be interesting to hear if the Sat check-outs will be able to get back home. Rental managers already advise that they have received calls from renters requesting late departures or extended stays. The local news last night reported a Canadian family trying to fly home that has been delayed 5 days because of airport closings and connecting flights. What a great reason to buy property here! Our condo listings were all occupied this week, so there will be a flurry of showings mid-day tomorrow as some of these guests depart and units are cleaned before the next arrivals. Like last Sat, I’ll be out showing homes again too. After a few news items, below is a report of the Sanibel and Captiva Islands Multiple Listing Service action over the last week. With no REALTOR® Caravans last week or this, it will be back to our regular Thurs morning schedule next week, alternating each week between east-end and west-end. During the busy winter season, we will continue to hold listings open as they are vacant on Thurs mornings. Serious prospective buyers learn that the islands have their most open houses during that time. Next Sat is the Installation and Awards Banquet for our Sanibel and Captiva Islands Association of REALTORS®. With a record number of reservations made, we are excited that Florida REALTORS® 2014 President Sherri Meadows and National Association of REALTORS® 2016 President Tom Salomone will be here to perform the installations. Yours truly is the emcee. Should be fun! • Provide another option to the city’s popular 22.6-mile network of paved, shared-use paths. “For folks desiring a longer trek or ride, the trail system is accessible to the paved path along Periwinkle, via a crosswalk at Roadside Park. “James Evans, city director of natural resources, calls the trail a “tool to get the people out to enjoy the nature, and see why they’re buying these lands” for conservation. The trail meanders behind several businesses, including Bennett’s Fresh Roast coffee and doughnut shop and the Lazy Flamingo restaurant and Dairy Queen restaurants. At this time, there is no plan to connect business properties to the trail, although Evans didn’t rule that out after all of the improvements are made. “The city purchased the tract now called Pond Apple Park in 2001, after a voter referendum. It’s made improvements as grant monies became available; however, the process ramped up through partnerships with the state Department of Environmental protection and the Sanibel Captiva Conservation Foundation. The foundation owns the former homestead of the pioneering Bailey family, best known today for Bailey’s General Store. 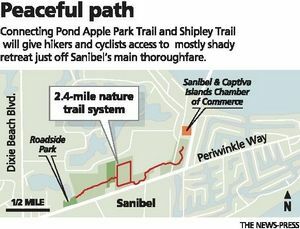 Pond Apple Park Trail will connect to the Shipley Trail that runs behind the Baileys’ old home, but currently is closed to public use. “Foundation officials are leery of talking about their plans until they have all of the permits. A fundraising page at sccf.org mentions such possible future public activities at the homestead property as a native plant nursery and a butterfly house, and self-guided house tours. “Wildlife already is robust along the trail, and includes a bald eagle nest as well as alligators and an array of birds that frequent a pond of treated wastewater that’s stored for use in residential and golf course irrigation. 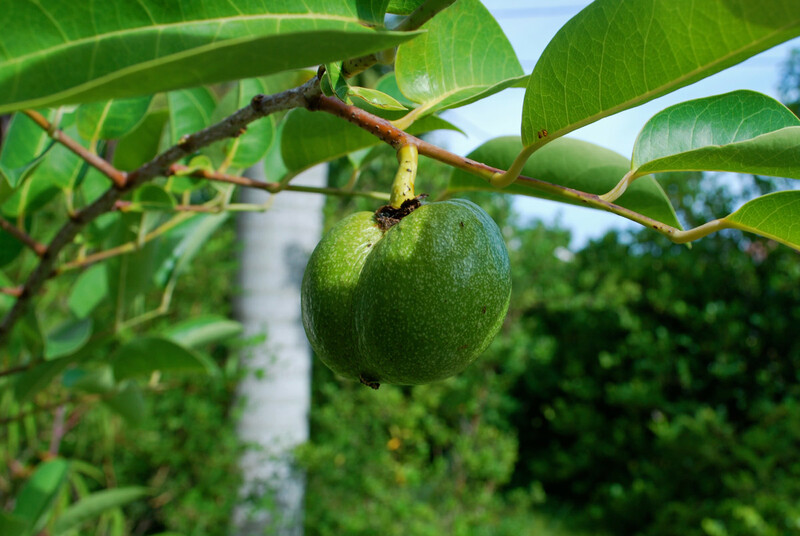 Habitats include a pond apple slough, pine flat woods and a tropical hardwood hammock. The stretches of boardwalk, 270 and 420 linear feet respectively, will have aluminum rails. The composite decking with a wood-grain look and a non-slip surface will be about 18” off the ground. This will permit water flow, but make cycling and hiking safer in the wet months. “From birding and biking the Refuge, to learning about gators and crocs, the seasonal calendar of FREE programs and tours at the Refuge begins today, Jan 2, 2014, and runs through Apr 25. “Pending home sales in Nov posted the largest gains in the South and West, rising 2.3% and 1.8% month-over-month, respectively. The increases helped to offset declines in pending home sales in the Northeast (down by 2.7% in Nov) and the Midwest (down by 3.1%). “Total existing-home sales are expected to end the year with nearly a 10% gain over 2012. However, Yun says that existing-home sales will likely remain at around 5.1 million in 2014. A rise to 5.3 million in existing-home sales is expected for 2015. “Home prices rebounded in 2013, helping more than 3 million home owners regain long-lost equity, according to CoreLogic’s latest MarketPulse report. “We’re encouraged by the improvements of the past year and have every reason to be cautiously optimistic about continued progress in 2014. That said, monitoring the current and potential headwinds the industry faces is critical,” says Anand Nallathambi, president and CEO of CoreLogic. More than two-thirds of all homes with a mortgage now have at least 20% equity, giving home owners more options in the housing market in the new year and increasing their employment mobility. Another article from the same “FloridaRealtor®” magazine continues the discussion on flood insurance in Florida. When showing property today, the most frequent questions from prospective buyers and sellers are about flood insurance. 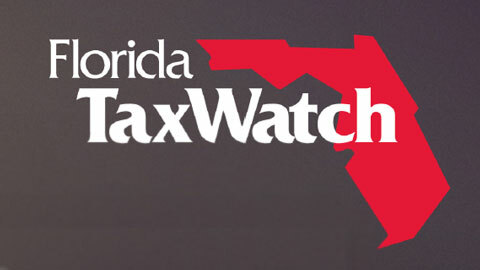 “A new study by Florida TaxWatch, a non-partisan research group, confirms what Florida Realtors® has said all along: Florida policyholders make a major financial contribution to the National Flood Insurance Program (NFIP) but not its biggest beneficiary. “Congress passed the Biggert-Waters Flood Insurance Reform Act of 2012 to help reduce the $25 billion debt of the NFIP by bringing rates charged more in line with the risk and losses in flood-prone areas. Many discounts and subsidies policyholders received in the past will be eliminated or phased out. Most of NFIP’s current $25 billion debt is due to claims from Hurricane Katrina and Hurricane Sandy, which had minimal impact on Florida. Floridians paid $3.60 in premiums for every $1 collected in flood claims from the program. Eleven states (not Florida) have received more in payouts over the 30-year period of the study than their policyholders paid in premiums, with six of those states receiving at least double the amount that policyholders paid in premiums. 2 price changes: White Pelican #123 2/2 now $799K, Pine Cove #1A 2/2 now $849K. 4 closed sales: Colonnades #13 1/1 $150K (short sale), Beach Road Villas #106 2/2 $287.5K, Oceans Reach #4C2 2/2 $779K, Gulfside Place #121 2/2 $928K. 6 new listings: 1890 Farm Trail 3/2 $489K, 450 Lake Murex Cir 3/2 $569K, 566 N Yachtsman Dr 3/2 $995K, 2405 Wulfert Rd 4/5.5 $1.949M, 1306 Seaspray Ln 3/4 $4.195M, 5615 Baltusrol Ct 4/4/3 $4.699M. 4 price changes: 970 Sand Castle Rd 3/2 now $525K, 1824 Woodring Rd 4/4 now $1.395M, 5423 Osprey Ct 3/2.5 now $1.479M, 3744 West Gulf Dr 4/4 now $1.795M. 3 new sales: 398 Old Trail Rd 3/3 listed for $499K, 696 Durion Ct 3/2.5 listed for $599K, 211 Daniel Dr 3/2 listed for $749.9K. 3 closed sales: 731 Nerita St 3/2 $540K, 9405 Beverly Ln 3/2 $650K, 1950 Woodring Rd 3/3.5 $1.8M. 1 new listing: 592 Sea Oats Dr $350K. 1 price change: 761 Donax St now $224K. 1 closed sale: 1344 Eagle Run Dr $250K. 2 new listings: 51 Oster Ct 2/2.5 $795K, 16790 Captiva Dr 5/5 $5.9M. 1 price change: 15631 Captiva Dr 5/4.5 now $1.715M. Until next Friday, here’s to another successful selling season on Sanibel & Captiva Islands where even the winter weather is warm! This entry was posted in Captiva real estate, Florida property, Florida real estate, Real estate, Sanibel Island, Sanibel real estate, SanibelSusan, SanibelSusan's Blog and tagged Captiva, Captiva Island, Florida real estate, Multiple Listing Service, Real estate, Sanibel, Sanibel Island, SanibelSusan, Southwest Florida by SanibelSusan. Bookmark the permalink.